Many people think that the maintenance of their car is very important, but not all of them believe the same is true for their garage door. In fact, regular maintenance of the door can extend its lifespan, and because we are talking about a large and heavy mechanism that moves multiple times a day, it's also essential for the safety of your family. Some small parts of your garage door may require professional service and replacement from time to time. From loose hardware, bent or broken parts, or cable wear, we can help you with any minor repairs you may need. Just get in touch the moment you notice something is amiss and we'll be glad to help. The screws on a garage door are often in need of attention, because they may become loose with time. Whether you need to have the screws checked or you need them replaced altogether, we offer you the proper advice to enhance the security of the door. 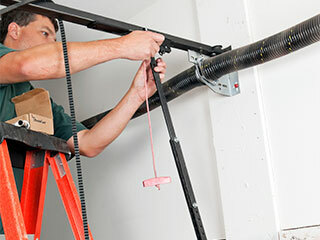 Any minor problem with spring tension may make your garage door open or close unevenly. To solve this problem, you should have regular spring testing arranged for your door. Depending on the type of door you own, we'll be able to test your springs and make any necessary adjustments so that your door works as it should every time. Schedule your appointment today with just a phone call and we'll make sure your garage door is well looked-after and in the best condition!